Here is a super easy soup to make for those cold days when you are hunckered down in a snow storm and have a craving for something smooth, hot and yummy. This one is so easy, even your other-half can put this one together, mine did, and it is fantastic and full of flavour! 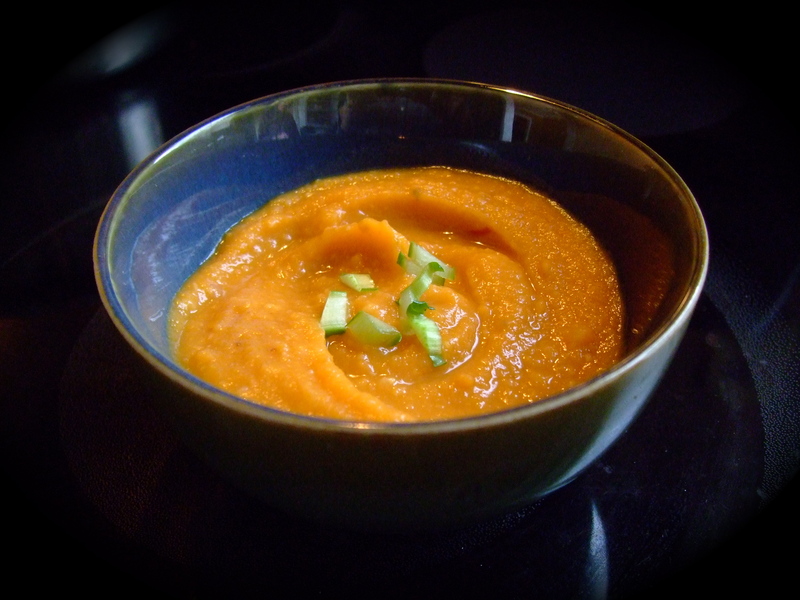 Sweet Potatoes are the pinnacle of the nutritious vegetable list and this easy blender soup pops with taste without a speck of cream or butter added. It works in the fanciest soup bowls or in mugs with a crust of bread. Lightly oil a very large baking pan. Peel potatoes and slice chunks. Peel garlic cloves and place both in baking pan. Drizzle with olive oil and toss to coat. Bake for 20 minutes, remove garlic cloves and then turn potatoes over and continue to roast for another 15 minutes. Place chopped garlic in a blender or food processor. Add roasted garlic, and a few pieces of roasted sweet potato, salt and half the broth. Pulse until puréed, scraping down the side of the bowl with a spatula. Add the remaining potatoes and broth as well as about 1 1/2 cups water if your blender or food processor is large enough. Continue pulsing and scraping down bowl until all is puréed. For a silky texture, turn part of the purée into a coarse sieve set over a bowl. Use the back of a spoon or spatula to push purée through. Repeat with the rest of the purée. Pour the remaining 1 1/2 cups water into a large saucepan set over medium heat. When bubbling, add the purée. Stir often until it comes to a boil. Lower temperature so it barely simmers and cook for about 1o minutes, stirring often to incorporate flavours. If thicker than you like, thin with water. Garnish if desired with sliced green onion or fresh chives or basil. This can be made well ahead of time and reheated for guests. This also stores well in the freezer. It can be kept warm for a buffet in a slow cooker. Mmmm, enjoy! Thanks to Lady Locavore’s mate for discovering this recipe in the Food & Drink, Winter 2011 edition. This entry was posted in Uncategorized and tagged Soup, Sweet Potatoes. Bookmark the permalink.